The Surge was a pretty divisive game when it launched last year. We weren't particularly enamoured with it, but some enjoyed its sci-fi spin on Dark Souls-esque gameplay. Focus Home Interactive has released a trailer for The Surge 2, and it looks like there will be a greater variety of environments to fight through. The first game took place almost entirely indoors, in the trailer we see what appears to be a more natural setting. This man-made forest is just one area in a more open city, so it sounds like the sequel is improving things in the right ways. Hopefully it all comes together in the end. 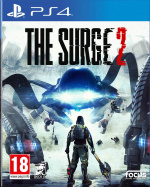 Are you looking forward to playing The Surge 2 when it releases next year? Mech up your mind in the comments below. Didn't play the first one, but I really hope this one will be good ! The all indoors setting was a huge turn off, so this is good to see. Loved the first one. This is an instant buy for me. @Splints - Same here, one of my favourite platinum trophies so far. Fantastic game! @Splints @Shigurui I still need to buy the first game, did it have a real deep story/plot? @KidBoruto The story is adequate to push you moving through the areas... It will in no means blow you away but it stands on its own. A lot of the story is through your interactions with people and audio files so you will get as much out of the story as you want. I personally enjoyed the story and had a blast with the game but I could also see how people could find the story the weakest part of the game... I hope that helps?